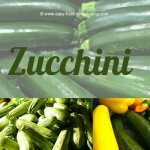 Here's an easy plastic wrap guide - in pictures! Why use plastic wrap? It helps protect sharp/crisp dehydrated foods from puncturing other bags while in the Mylar bags. Read the descriptive steps below the photos. Here's an easy plastic wrap guide – your dehydrated fruit and vegetables can have this optional plastic wrap protection – easy to do as shown in the eight photographs below! step 5 - Fold excess 'wings' see dotted line! step 8 - Turn your package over so you can see your hand-written contents on vacuum bag through the wrap! Dare I Now Say "It's a Wrap"?! NOTE: When you have taken out a packet of dehydrated food to use, don't throw away the plastic wrap! Instead, wrap it around an old cardboard paper-towel roll tube or fold the plastic wrap gently – and USE IT AGAIN! When you have dehydrated your food, it can become brittle and pretty sharp. Always use good quality vacuum bags and I've given you a good supplier on the vacuum bags page link, and/or check out the vacuum sealer bags link here for DC Processing Equipment. To prevent the dehydrated food packets from puncturing the bag that's next to it in the Mylar bag, wrap the vacuumed bag first with plastic wrap, and follow the pictorial guide, above! 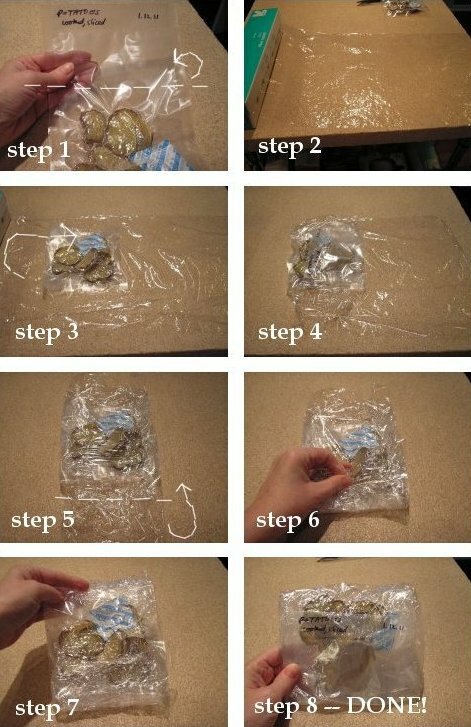 Dehydrate the food, (condition it too), then vacuum seal it with a 100cc oxypack. Wrap the package in plastic wrap to soften the corners to avoid puncturing other bags. Put those packages in the Mylar bags along with a 300cc oxypack in the Mylar bag. Seal the Mylar bag, and write on it the bag’s contents, and the date. Lastly, put these Mylar bags in the bins and buckets with a 2000cc oxypack.